Children’s preventative dentistry lays the foundations of a lifetime of positive dental health and at Dentalspa Geelong we specialise in helping families achieve optimal dental health – so your child may never experience tooth decay. Dentalspa Geelong makes going to the dentist for children a positive experience, with our children’s dentists working with each child to encourage them toward better oral health and dietary practices. Families will feel right at home in our child friendly waiting area to keep your children entertained while visiting. As an added incentive for good dental health practice between visits, children will be rewarded in our Cavity Free Club each visit they remain decay free. Click here to discover our Cavity Free Kids Club. As of January 2014, the government is offering a dental incentive called the child dental benefit scheme for children aged 2 – 17. Under the scheme, families who receive Family Tax Benefit Part A will be eligible for $1000 worth of Medicare-funded treatment over a two-year period. Click here to read more about the child dental benefit scheme. 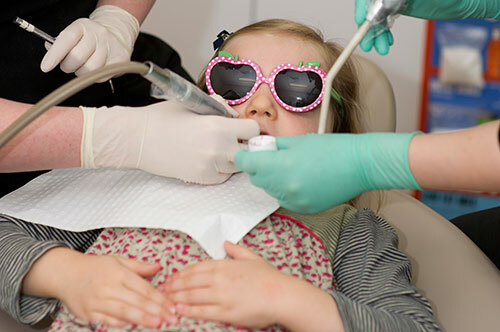 Fissure sealants are a common preventative dentistry technique used by our dental professionals at Dentalspa Geelong to reduce the chance of children experiencing tooth decay in their molars. A fissure sealant is a painless and non-invasive dental preventative treatment that involves applying a thin coating to a child’s molars – to help smooth out fissures and grooves that may trap plaque and food, even after brushing. Applying fissure sealants to a child’s teeth is a short dental procedure, aethetically pleasing and once in place actively protects the tooth from plaque and acids. Call our friendly team on (03) 5223 1555.